Notice : the petticoat is not include . size 6 Bust: 82cm, Waist: 63cm, Hips: 87cm, total length (from underarm to hem):130-135CM. size 8 Bust: 87cm, Waist: 68cm, Hips: 92cm, total length (from underarm to hem):130-135CM. size 10 Bust: 92cm, Waist: 73cm, Hips: 97cm, total length (from underarm to hem):130-135CM. 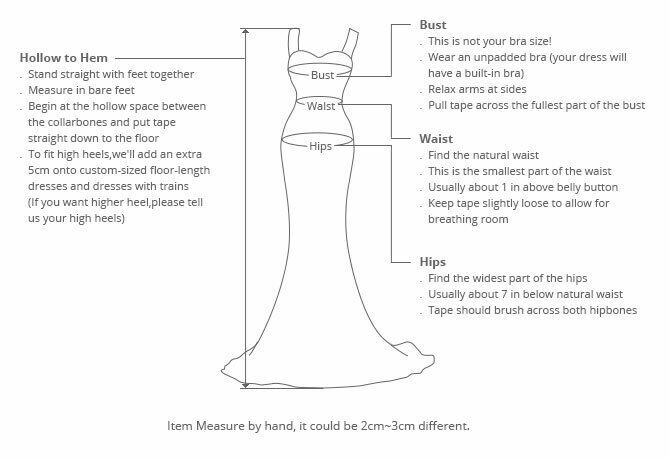 size 12 Bust: 97cm, Waist: 78cm, Hips: 102cm, total length (from underarm to hem):130-135CM. size 16 Bust: 107cm, Waist: 88cm, Hips: 112cm, total length (from underarm to hem):130-135CM.